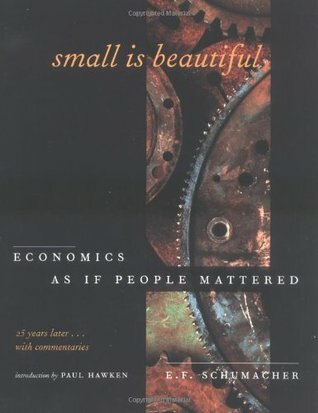 Like William Catton's Overshoot: The Ecological Basis of Revolutionary Change, the fact that Small is Beautiful was published in 1973 is simply frightening. That a book this rich with understanding, bursting with enthusiasm and ideas for moving our society towards a human utopia has managed to shift so little of our civilization's efforts indicate the stubbornness and institutional inertia that will bring it crashing down. Schumacher understood the predicament we are in now when it was far less dire; he gave realistic, extremely well thought-out ideas that could practically help us escape that doom and move quickly towards a positive, healthy way of life. I suspect that I will someday look back on the time I read this book as a powerful directing experience. The idea of intermediate technology in particular speaks to me as a great way to solve a number of problems at once. Appropriate technologies allow a community to use the resources (natural and social, renewable and not) it has to create a sustainable, fairly independent local economy that provides good lives to everyone involved. It ameliorates economic inequality and gives people a way to stand up for themselves. Intellectually, Small is Beautiful was just what I needed to finally fill in the gaps between my ideological tenets and the real-world practical understanding that I am seeking today. I could never overcome the moat of mythology surrounding my anarchist understanding of economics and society to effectively articulate the problems I saw intuitively with the traditional economic explanations and justifications I got from my Dad and saw in mainstream publications. Now, while I could probably not do a very good job articulating them, Schumacher has given me ways to think about these problems that put them in the language of traditional economics but illustrate the omissions and errors that perspective includes. I believe this book has given me a depth and number of revelations comparable to my most profound, influential reading experiences: Derrick Jensen's Endgame, Jared Diamond's Collapse, Overshoot, etc. Sign into Goodreads to see if any of your friends have read Small Is Beautiful.